You are here: Home / Furniture Gallery / Would You Put this In Your Dining Room? Would You Put this In Your Dining Room? 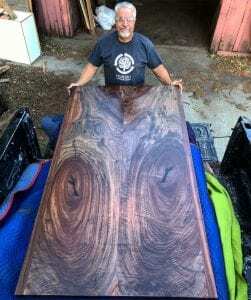 This is a gorgeous book matched Claro Walnut Table top that we created from 2 live edge slabs that came from a log we personally salvaged. You can read about the tree and see us salvaging it here. This table is finished with 10 sheen spray on conversion varnish. Contact us today about creating your forever table.